It's a sad day for cynical sports fans like myself. 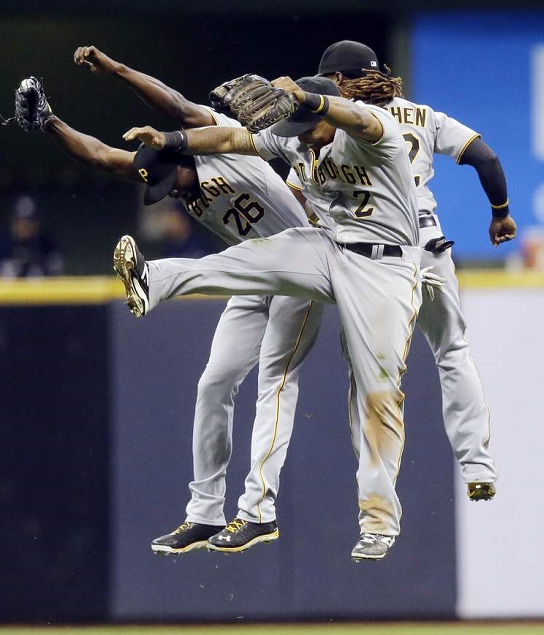 For the first time since 1992, the Pittsburgh Pirates will finish the season at or above .500. With a 4-3 win over the Milwaukee Brewers on Tuesday, the Bucs tallied their 81st W of the year. The victory guarantees the club will not finish the season as a losing team, effectively ending the longest stretch of futility in Major League Baseball history. In fact, the win ends the longest such drought in North American sporting history. Please don't get me wrong here, it's not that I don't like the Pirates. Quite the contrary, actually. It's just that I love to see streaks continue in sports, as many fans do. I do not discern between positive and negative streaks, I just don't care to see these things spoiled. Alas, whether it's Joe DiMaggio's 56-game hit streak or the Cleveland Cavaliers' 26-straight losses, all things must come to an end eventually. And the way the Pirates have been playing ball the last couple of seasons, it was only a matter of time before their long drought ended. So was the case when Travis Snider hit his 4th home run of the season in the top of the 9th inning last night, giving the Bucs a 4-3 lead they never relinquished. Here's some perspective for you; the last time Pittsburgh had a winning team, Snider was only 4-years-old. While the streak has ended, the season is just beginning for the Pirates. The win put them at 81-57, back atop the NL Central in their hunt for October. Pittsburgh has a 2-game cushion in the division, and it appears they will find their way to the postseason, giving fans something to truly be excited about for the first time in years. Not that I believe it will happen, but how great would it be to see the streak of failure in Steel Town end during the same season the team wins their first World Series title since 1979? It's the kind of thing I thought they only wrote about in works of fiction. Been a Pittsburgh fan all my life and I was only a child the last time they were relevant. It got to the point where I was starting to think they'd never be good again in my lifetime. So happy to see them playing well. I'm not even going to be greedy and ask for a championship, I just want to see them make the playoffs for the first time in my adulthood. Screw that, I'm greedy. I want us to win the whole thing. Bucs!!!!!!!!! I'm glad to see the Pirates relevant again and it's a feel-good story and all, but they're not winning the whole thing. Not this season, anyway. Not enough offense.